DummyEncrypter is a ransomware virus. The malware that unwraps the virus is hidden in an executable file. That file pretends to be the installer of CCleaner, while using its icon, name and other details to make it believable and try to trick users and their AV software. After execution of the malicious script your files will become encrypted and a screen locker will pop up, containing the ransom payment instructions. To see how to remove the virus and how you can try to restore your encrypted files, read the article in full. Symptoms The ransomware cleverly pretends to be CCleaner, but if executed, you will get your files encrypted and see a ransom note presenting the DummyEncrypter’s demands. User Experience Join Our Forum to Discuss DummyEncrypter. Other ways that the DummyEncrypter virus could be spreading its malicious payload may exist as well. One of them can be through spam emails. Spam mail usually has an attachment. That attachment hides a malicious script that will infect your computer system when executed. Social media and file-sharing websites could distribute such files, too. Try not to open files from suspicious sources like emails and links until you at least do a scan with a security program and check their size and signature first. You should read the ransomware prevention tips from the thread open in the forum section. DummyEncrypter is a ransomware virus that was recently found by the malware researcher Karsten Hahn from G Data. One interesting fact about the virus is that it pretends to be the cleaning tool CCleaner by Piriform. 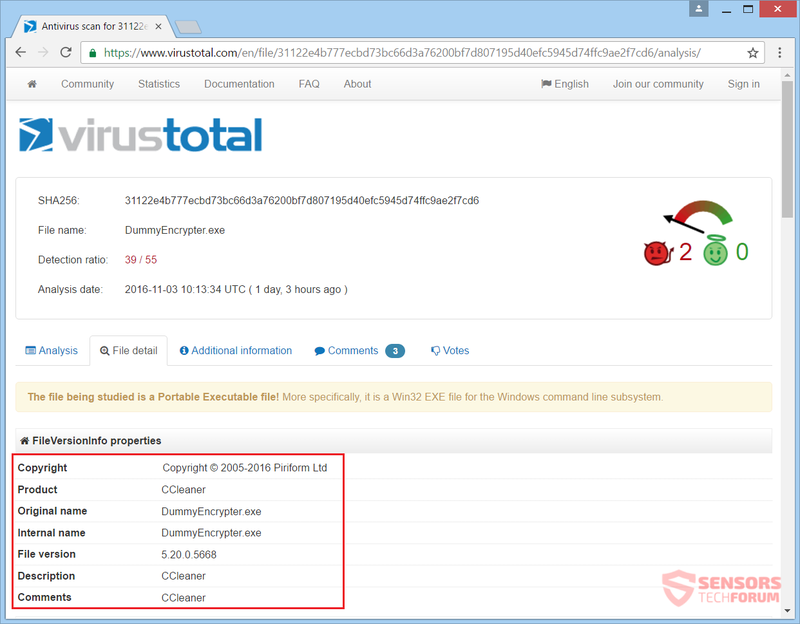 The virus makes its payload file to look exactly like the setup for the cleaning program, so it’s advised to download any software only from its official website. In case you have opened the executable, you will see a Command Prompt window flash on your screen and then your files will become encrypted. Right after that, the ransom instructions will be displayed in a message. After the encryption process is set and done, the message will load on your desktop as a lock screen. When the DummyEncrypter virus has executed its payload and infected your machine, it could also create multiple entries in the Windows Registry. That action is often performed by such ransomware viruses so that they can attain a higher level of persistence. Registry entries can make the malware launch automatically at every boot of the Windows operating system. Your data will then become encrypted, and you will witness the ransom note popping up on your desktop. Warning: Your data has been encrypted! Your personal data has been encrypted by a safe technology called AES-256 with US federal government trusted. When you see this message, we has ENCRYPTED your data by a KEY generated randomly by your machine, and we uploaded this key to our server. The only way to decrypt your file is use the KEY corresponding the YOUR FILE. Once encrypt complete we destroyed keys on this machine and only keeps a feature of this machine. The other parts of your computer is just safe now. Do not worry. We do not harm your computer. But some applications may lost data or texture and unable to start. Once you unencrypt you can use it normally again. We has been encrypted your 0 files so far. 2)	Access the software provider and follow the introductions. 2. Use DummyUnlocker to restore. DummyEncrypter will not rush you as it does not give you a deadline for paying the ransom. However, it will try to trick you into thinking that the only way that you can restore your files is to pay for an unlocker tool. That is not true, and you should NOT in any way pay the cybercriminals – this will fund them to perform more criminal acts. Nobody can guarantee you that all of your files will become useable again upon payment. Furthermore, the criminals will probably keep improving their ransomware and could probably encrypt your files in the future. 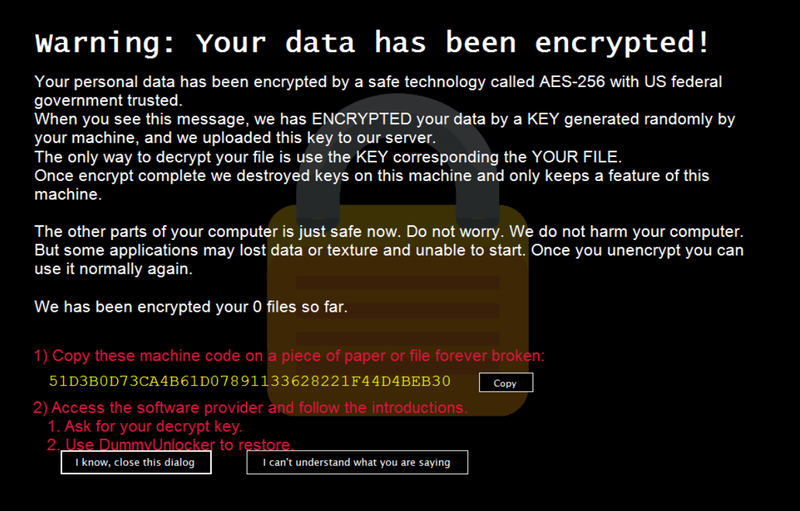 The DummyEncrypter ransomware uses the AES 256-bit encryption algorithm or so it claims. File types which are encrypted are documents, photos, database files, etc. Read below about what ways you might try out to restore some of your files back to normal. If your computer got infected with the DummyEncrypter ransomware virus, you should have some experience in removing malware. You should get rid of this ransomware as fast as possible before it can have the chance to spread further and infect more computers. You should remove the ransomware and follow the step-by-step instructions guide given below. To see ways that you can try to recover your data, see the step titled 2. Restore files encrypted by DummyEncrypter. Threats such as DummyEncrypter may be persistent. They tend to re-appear if not fully deleted. A malware removal tool like Combo Cleaner will help you to remove malicious programs, saving you the time and the struggle of tracking down numerous malicious files. Threats such as DummyEncrypter may be persistent on your system. They tend to re-appear if not fully deleted. A malware removal tool like SpyHunter will help you to remove malicious programs, saving you the time and the struggle of tracking down numerous malicious files. Note! Your computer system may be affected by DummyEncrypter and other threats. SpyHunter is a powerful malware removal tool designed to help users with in-depth system security analysis, detection and removal of threats such as DummyEncrypter. 1. Install SpyHunter to scan for DummyEncrypter and remove them. 2. Scan with SpyHunter, Detect and Remove DummyEncrypter. Ransomware infections and DummyEncrypter aim to encrypt your files using an encryption algorithm which may be very difficult to decrypt. This is why we have suggested several alternative methods that may help you go around direct decryption and try to restore your files. Bear in mind that these methods may not be 100% effective but may also help you a little or a lot in different situations. Note! Your computer system may be affected by DummyEncrypter or other threats. Remove DummyEncrypter by cleaning your Browser and Registry. Fix registry entries created by DummyEncrypter on your PC. Combo Cleaner is a powerful malware removal tool designed to help users with in-depth system security analysis, detection and removal of threats such as DummyEncrypter. Step 5: In the Applications menu, look for any suspicious app or an app with a name, similar or identical to DummyEncrypter. If you find it, right-click on the app and select “Move to Trash”. Step 6: Select Accounts, after which click on the Login Items preference. Your Mac will then show you a list of items that start automatically when you log in. Look for any suspicious apps identical or similar to DummyEncrypter. Check the app you want to stop from running automatically and then select on the Minus (“–“) icon to hide it. Remove DummyEncrypter – related extensions from your Mac’s browsers. A pop-up window will appear asking for confirmation to uninstall the extension. Select ‘Uninstall’ again, and the DummyEncrypter will be removed. When you are facing problems on your Mac as a result of unwanted scripts and programs such as DummyEncrypter, the recommended way of eliminating the threat is by using an anti-malware program. Combo Cleaner offers advanced security features along with other modules that will improve your Mac’s security and protect it in the future. Hey !, I found this information for you: "Remove DummyEncrypter Virus and Restore Your Files". Here is the website link: https://sensorstechforum.com/remove-dummyencrypter-virus-restore-files/. Thank you.